(At midnight) O God, who hast enlightened this most sacred night by the brightness of him, who is the true Light; grant, we beseech thee, that we who have known the mysteries of this light on earth, may likewise come to the enjoyment of it in heaven. Who liveth and and reigneth, world without end. Amen. (At Break-of-day) Grant, we beseech thee, O Almighty God, that, as we are enlightened by the new light of thy Word become flesh, we may show in our actions the effects of that faith that shineth in our minds. Through the same Christ our Lord. Amen. (At Day-time) Grant, we beseech thee, O Almighty God, that we who groan under the old captivity of sin, may be freed therefrom by the new birth of thy only begotten Son. Through the same Christ our Lord. Amen. 1. Sermon of Saint Leo, Pope. 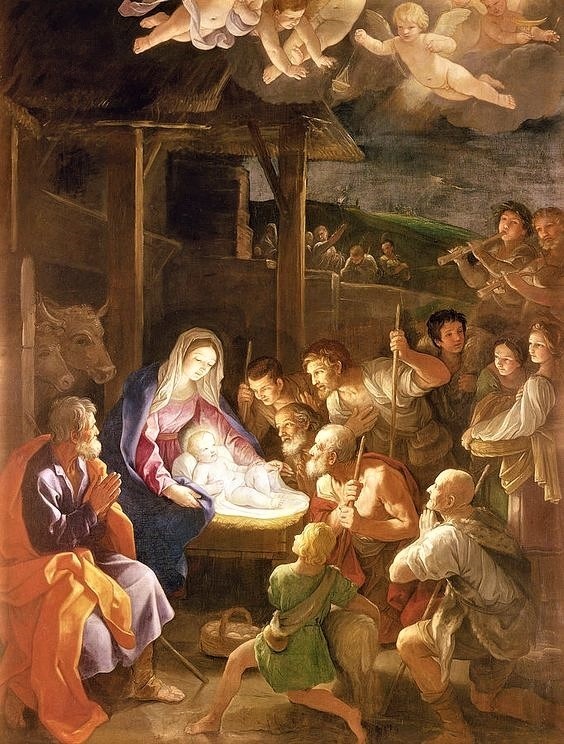 On this day, dearly Beloved, is born our Saviour: let us be glad: for, surely, it is a sin to be sad on the Birth-day of that Life, which, ridding us of the fear of death, gladdened us with the promise of immortality. From a share in this gladness, not one of us is excluded. To all, there is the one same cause of joy: for, our Lord, the destroyer of sin and death, came to deliver all, seeing that all were slaves to guilt. Let the Saint exult, because he is now brought near to his crown; let the Sinner rejoice, because he is invited to his pardon; let the Gentile be of good heart, because he is called to life. For, when there had come the fulness of time, fixed by the inscrutable depths of the divine counsel, the Son of God assumed to himself the nature of man, in order to restore it to the favour of its Maker; that thus, the Devil, the author of Death, might be conquered by that very nature, whereby himself had conquered. In the conflict thus entered into for our sakes, the combat was fought by our Omnipotent God with great and admirable equity; inasmuch as it is not in his own Majesty, but in our lowliness, that he attacks our bitter foe; opposing him with the self-same form, and self-same nature as ours, Man like us in everything save sin: for, that which is written of all men, had no place in this Nativity: “Not one is free from defilement, no, not the child whose life on earth is but one day.” Into this admirable Birth, then, there passed nothing pertaining to the concupiscence of the flesh, there entered not aught of the law of sin. A Virgin of the royal family of David is chosen, who, having to be made Mother of the Divine Child, the God-Man, conceived him in her soul, before she conceived him in her womb. And lest the ineffable mystery should make her fear, were she left ignorant of the Divine plan, she is told by the Angel of that which was to be done in her by the Holy Ghost, and was given to see how she could be Mother of God, yet remain a pure Virgin. Let us, therefore, dearly Beloved, give thanks to God the Father, through his Son, in the Holy Ghost: because, through his exceeding charity, wherewith he hath loved us, he has had compassion upon us; and when we were dead in our sins, quickened us unto life together with Christ, that we might be a new creature in him, and a new substance. Therefore, let us put off the old man with his acts, and, having been made partakers of the generation of Christ, let us renounce the works of the flesh. Learn thy own worth, O Christian! and, having been made a partaker of the divine nature, scorn to become again the vile thing of old. Remember of what Head and of what Body thou art a member. Remember how thou, having been snatched from the power of darkness, hast been translated into the Light and Kingdom of God. 2. Sermon of St. Bernard of Clairvaux, Abbot, Confessor, & Doctor of the Church. THE solemnity of our Lord's Nativity is indeed a great and glorious day, but a short one, and a short day calls for a short sermon. Conform yourselves to it, and be ye renewed in the spirit of your mind. Aim at humility; it is the foundation and the guardian of all virtues. Follow after it, for it alone can save your souls. What is more deplorable, what more hateful, what more grievously punishable than that, after seeing the God of heaven become a Little One, man should any longer endeavour to glorify himself upon earth? It is an intolerable insolence that when Majesty has annihilated itself, a worm of earth should inflate and puff itself up. It was to make reparation for this pride that He Who, in the form of God, was equal to the Father, “emptied himself, taking the form of a servant.” (Phil, ii. 7) He emptied Himself yes, of His majesty and His power, not of His mercy and His goodness, for the Apostle tells us “the goodness and kindness of our Saviour hath appeared.” (Titus, iii. 4) His power had appeared in the creation of the world, His wisdom has ever been manifested in its government, but now in His humanity His goodness and mercy are more specially made known. He had shown His power to the Jews in signs and prodigies; therefore you will often find in the writings of the Old Law such expressions as “I am the Lord,” “I am God.” To the ancient philosophers, abounding in their own sense, he likewise made His majesty known, according to those words of the Apostle, “That which is known of God is manifest in them, for God hath manifested it to them.” (Rom, i. 19) The Jews were subdued by this same power; the philosophers, searchers into majesty, were overwhelmed by His glory. Power exacts subjection, majesty inspires awe, but neither oblige to imitation. Let thy goodness, O Lord, now appear, that man, who is created in Thy likeness, may be conformed to it; for power, majesty, and wisdom are not what we can imitate, or what it is expedient that we should copy. In the case of the angels Thy mercy was withheld from a portion only of them; afterwards the whole human race was overwhelmed by Thy judgment. Let mercy extend her dominion, let her reach from end to end mightily, and dispose all things sweetly. In the past, Lord, Thou didst limit Thy mercy by judgment; come, we beseech Thee, now, flowing with compassion and overflowing with charity. What dost thou fear, O man? Why dost thou tremble before the face of the Lord" because He cometh"? It is not to judge the earth that He comes, but to save it. Fly not, man, fear not; Jesus comes not in anger, He comes not to punish: He comes to seek thy salvation. And lest thou shouldst say even now, “I heard thy voice, and I hid myself,” (Gen. iii. 10) behold, He comes as an Infant, and without speech, for the voice of the wailing infant arouses compassion, not terror. If He is terrible to any, yet not to thee. He is become a Little One, His Virgin Mother swathes His tender limbs with bands, and dost thou still tremble with fear? By this weakness thou mayest know that He comes not to destroy, but to save; not to bind, but to unbind. If He shall take up the sword, it will be against thine enemies, and, as the Power and the Wisdom of God, He will trample on the necks of the proud and the mighty. We have two enemies, sin and death that is, the death of the soul and the death of the body. Jesus comes to conquer both, and to save us from both. Already He has vanquished sin in His own person by assuming a human nature free from the corruption of sin. For great violence was offered to sin, and it knew itself to be indeed subdued, when that nature which it gloried to have wholly infected and possessed was found in Christ perfectly free from its dominion. Henceforth Christ will pursue our enemies, and will seize them, and will not desist until they are overcome in us. His whole mortal life was a war against sin. He fought against it by word and example. But it was in His passion that He came upon the strong man armed, and bound him, and bore a way his spoils (St. Luke, xi. 22). Jesus Christ also conquers our second enemy, death. He overcomes it first in Himself, when He rises from the dead, the first-fruits of them that sleep, and the first-born from the dead. Afterwards He will, in like manner, vanquish death in all of us when He shall raise our mortal bodies from the dust, and destroy this our last enemy. Thus, when He rose from the dead, Jesus was clothed in beauty, not wrapped in swaddling-clothes as at His birth. He that previously overflowed with mercy, “judging no man,” girded Himself in His resurrection with the girdle of justice, and in so doing seemed in some degree to restrain His superabundant mercy in order to be thenceforth prepared for the judgment which is to follow our future resurrection. But Christ comes now, in His Nativity, as a Little One, with the prerogative of mercy, that His mercy, going before, may temper the justice of our future judgment. The water of wisdom is rightly called wholesome, for the wisdom of the flesh is death, and the wisdom of the world is the enemy of God. The only wholesome wisdom is the wisdom that is from God, and which, according to St. James's definition, “is first chaste, then peaceable.” (St. James, iii. 17) The wisdom of the flesh is sensual, not chaste. The wisdom of the world is turbulent, not peaceable. But the wisdom that is of God is first chaste, not seeking the things that are her own, but those that are Jesus Christ's; for, let no one do his own will, but consider what is the will of God. It is, then, peaceable, not abounding in her own sense, but rather yielding to the counsel or judgment of another. The third use of water is for irrigation. This is specially needed by young plantations and seeds newly sown, lest they be either stunted in growth, or wither away through want of moisture. Let, then, everyone who wishes to sow the seed of good works seek the water of devotion, that, being fertilized by the fountain of grace, the source of a good life, he may not wither away, but make progress in continual freshness of spirit. Let us now see if we can find a fourth fountain, and win back our paradise, to be beautified, like that of old, by the water from four fountains or springs. Because if we do not desire to have the earthly paradise restored to us, how shall we hope for the kingdom of heaven? “If I have spoken to you earthly things, and you believe not, how will you believe if I shall speak to you heavenly things” (St. John, iii. 12) In order, therefore, that by the manifestation of things present the expectation of the future may be made sure, we have a paradise far better and more delightful than that of our first parents. Our paradise is Christ our Lord. In this paradise we have already found three fountains; the fourth is yet to be sought. We have the fountain of mercy for washing away the stains of our sins; we have the fountain of wisdom, giving the waters of discretion for allaying our spiritual thirst; and we have the fountain of grace and devotion for irrigating the plants of our good works. The fourth fountain seems to be the fervid waters of charity. Hence the Prophet exclaims: “My heart grew hot within me, and in my meditation a fire broke forth.” (Ps, xxxviii. 4) And elsewhere: “The zeal of thy house hath eaten me up.” (Ps, Ixviii. 10) So that the just man loves justice from the sweetness of devotion, and hates iniquity from the fervour of zeal. Of these four fountains, three seem to apply specially to each of the three chief needs of the faithful. The first remission is common to all, for we all “offend in many things (St. James, iii. 2) and we have need of the fountain of mercy for washing away the stains of our sins. We have all sinned, and do need the glory of God,” (Rom, iii. 23) whether prelates, virgins, or married people. All, again, must hasten to the fountain of grace and devotion, that they may receive the unction necessary for fructifying their works and labours of penance and abstinence, and to enable them to act always in a spirit of cheerfulness, for “God loveth the cheerful giver.” (II Cor, ix. 7) This grace we ask in the Lord's Prayer under the name of our daily bread. Was it to signify the first four fountains that Christ was wounded in four places while still living on the Cross? while the fifth wound in His side was not inflicted till after He had expired. Jesus Christ: offers us the first four fountains during our life. He opens the fifth fountain to us after our death, when He leads us into the possession of eternal life. But see how, after treating of the mysteries of our Lord's Nativity, we have suddenly turned to the mystery of His Passion. Yet it is no wonder that we should seek in the Passion for the treasures that Christ brought us in His Nativity, since it was in His Passion that He poured out for us the price of our redemption. The beginnings of the three Gospels, which are said in the three Masses of Christmas Day. To each portion of these Gospels is appended a passage from a Homily by one of the Holy Fathers. 1. Homily of Saint Gregory, Pope. Since, by the divine bounty, we are, this day, thrice to celebrate the solemn office of Mass, we cannot speak long on the lesson of the Gospel; and yet, this very Nativity of our Redeemer compels us to say something, however brief. Why, then, is it, that when our Lord was about to be born, the world is enrolled; if not that hereby is shown, that He, who appeared in the flesh, is He that would enrol his elect in eternity? Just as, when speaking of the reprobate, the Prophet says: Let them be blotted out of the book of the living; and with the just, let them not be written. Then, again: Jesus is born in Bethlehem; 'tis well; for Bethlehem signifies a House of Bread, and Jesus said of himself: I am the living Bread, that came down from heaven. The place, therefore, in which he is born, had had the name of House of Bread given to it, because there would appear in the material reality of our flesh, He who was to refresh the souls of the elect with spiritual repletion. And, why is he born, not at his Mother's home, but away from it? Is it not, to show, how, by his assuming human nature, he was born, so to say, in a foreign country? 2. Homily of Saint Ambrose, Bishop. Here, see the beginning of the infant Church: Christ is born; and Shepherds are watching, as about to herd, into the Lord's fold, that Gentile flock, which had hitherto lived like brute animals, and this, lest, during the thick darkness of night, they might suffer from the attacks of spiritual wild beasts. And it is well said, that the Shepherds are watching, for Shepherds, trained by the Good Shepherd, do watch. So that, the Flock is the people; the Night is the world; the Shepherds are the Priests. Or, perhaps, we might interpret him to be the Shepherd, to whom it is said: Be thou watchful, and give strength; for, not only has our Lord set Bishops to guard the Flock, he has set the very Angels. 3. Homily of St. Augustine, Bishop. Lest thou shouldst think that this is some commonplace thing, as thou art wont to do when men talk to thee, hear what it is thou art to think: The Word was God. After this, some infidel Arian will come forward and tell me, that the Word of God was made. How is it possible, that the Word of God could be made, when God made all things by the Word? If this very Word of God was also made, by what other Word was he made? If thou reply, that the Word of the Word is the one by which he was made—then, I will answer thee, that this very one is He whom we mean by the Son of God. But, if thou do not say there is a Word that made the Word,—then grant, that He, by whom all things were made, was Himself not made, since He, by whom all things were made, could not make Himself. Therefore, believe the Evangelist. Part I - The prophecies in Old Testament leading to the Nativity of our Lord, and the application of His Nativity. Part III - History of Christmas. Part IV - Mystery of Christmas.